Jeremy knows all about what it’s like to be the new kid, and this time he’s ready to do whatever it takes to fit in. But sometimes you can be popular for the wrong reasons. Will Jeremy come through before he makes a real mess of things? Childhood can be tough, especially for someone desperate to fit in. 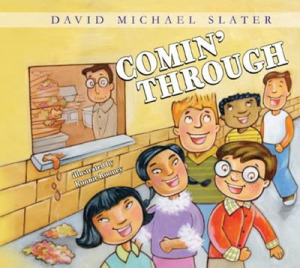 Comin’ Thru dramatizes one boy’s desire to be liked until he finds out that there are more important things. A twist at the end of the tale will surprise kids as they learn to recognize the importance of doing what is right. Peer pressure on children appears to be inversely related to parental pressure on children. This is not necessarily a good thing for children, as peer pressure is usually associated with negative behaviors. In this case the issue is becoming accepted by one’s peer group, by engaging in very negative behavior towards adults, and in this case the adult is the father of the child desperate to be accepted. The book will help teachers explore this very important issue with their students in the elementary and middle school years. The only problem I have with this book is that the adult is completely passive regarding this anti-social behavior. But on the other hand, adult sanctions would not have made the point that children must develop insights on their own regarding right and wrong as well as receiving messages from adults on this important issue.